The Carousel of Smiles seems to be catching on! The Golden Age of the Carousel,1870-1930, was a time when art and the industrial revolution coalesced, as immigrant artisans and industrialists created nearly 4,000 incredible wooden carousels. Names like Looff, Dentzel, The Philadelphia Toboggan Company (PTC), M.C. Illions, Spillman and Herschell rose to prominence. During the 1950’s, interest in carousels and county fairs had waned, and many once great machines were destroyed or discarded, more of a bother than something to be cherished. According to Bette Largent of The National Carousel Association, only 152 operating classic wooden carousels now remain. Every time a carousel goes to the auction block, those animals are never to be brought back together again. So people who hang on to intact rides are very important. They protect an important part of American Heritage. The 1970’s brought a renewed interest in the carousel arts, especially the hand carved horses and animals. Though some machines were resurrected and preserved intact, most of those not remaining in operation were broken up; the individual horses and parts sold piecemeal, forever losing those icons of American Culture. We’re getting press! Check out our featured write-up on page 20 in the latest issue of Sandpoint Magazine, Winter 2017 edition. 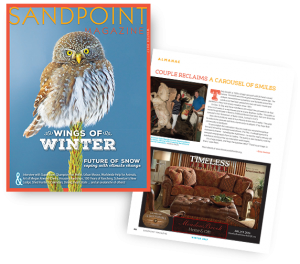 Pick up a your free copy of the magazine at distribution locations around town, or read the online edition of Sandpoint Magazine here.